Flood warnings remain in effect for rivers and creeks in much of North Texas after heavy overnight rain and light rain for much of Wednesday. 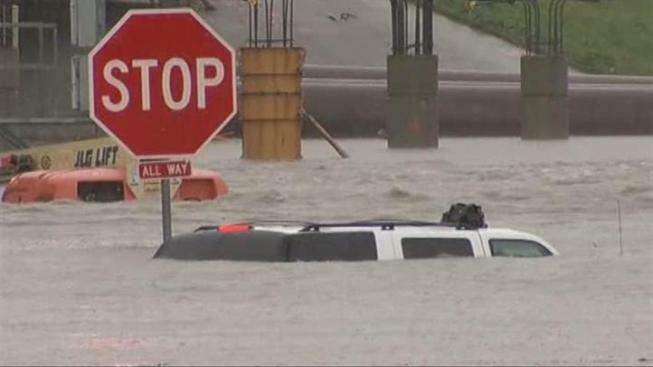 Heavy storms pushed into North Texas from the south Tuesday night and Wednesday morning, flooding several roads. At Dallas-Fort Worth International Airport, the 24-hour total of 4.27 inches of rain set an all-time record for January. Thirty-two flights were delayed or canceled because of the weather. Rainfall in Dallas measured 4.49 inches, 3.84 inches in Fort Worth, 3.49 inches in Denton and 4.41 inches in McKinney, according to NBC 5 Meteorologist Grant Johnston. 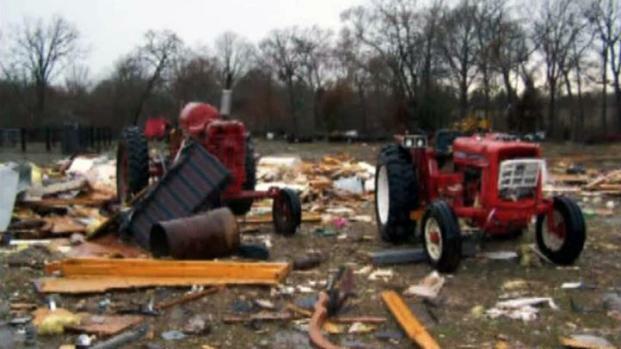 In East Texas near Palestine, at least three homes were hit by a possible tornado. The widespread, soaking rains resulted in lake levels going up -- in some cases by 3 to 5 feet. They will continue to rise in the next day or two as more floodwater flows down creeks and into the lakes. North Texas can expect more light rain overnight into Thursday morning, but totals will probably average a quarter inch or less, NBC 5 Chief Meteorologist David Finfrock said. The storms knocked out power to about 5,000 customers in Dallas and a few hundred in Fort Worth. By the afternoon, the total number of outages had dwindled to only a few hundred. The heavy rains flooded several roads in Ellis County, prompting the Venus Independent School District to cancel classes Wednesday saying the hazardous roadways posed too much of a threat for school buses. "We have several low lying areas and particularly on FM 157. Sometime between 4:30 a.m. and 6 a.m., the water started covering several roads completely. It was reported that one car had washed into the ditch and that the water was rising," said Venus Superintendent Bobby Matthews. "I sent an Alert Now call out to approximately 3,000 phones to the parents to let them know that school had been canceled. Safety must always come first." High water on roadways continue to be a very real threat to North Texas drivers. On Tuesday night, a driver in Rowlett was rescued after getting stuck under a bridge while Wednesday morning there were dozens of calls for water rescues and stranded motorists in cities across the Metroplex. In East Texas near Palestine, at least three homes were hit by a possible tornado that slammed into a rural area near Tennessee Colony. One home was leveled, and debris was scattered over a wide area. Luckily, no one was inside at the time. At least three tornadoes touched down northwest of Houston, knocking down trees and destroying a tire shop. National Weather Service meteorologist Gene Hafele said a tornado hit a tire shop in Somerville about 90 miles northwest of Houston. As the storms moved on, a tornado toppled trees and damaged cars in downtown Brenham, about 70 miles northwest of Houston. A third tornado was seen in Waller County, about 60 miles northwest of Houston. In San Antonio, the weather service was trying to determine if a tornado damaged a number of homes there. The roofs of several homes were ripped off during an early-morning storm. There were also reports of storm damage in Huntsville.